Writing in Intercept, Glenn Greenwald delivered bad news to progressive Democrats under the glaring headline: Elizabeth Warren Finally Speaks on Israel/Gaza, Sounds Like Netanyahu. 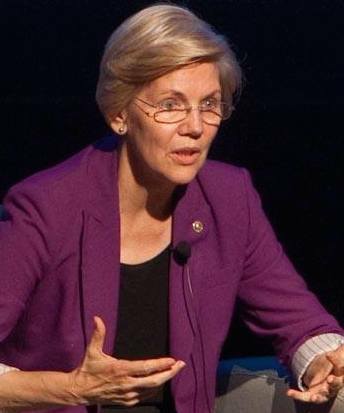 As I reported in an earlier posting, the information on Warren’s views on the Israeli invasion of Gaza emerged during a political gathering in Hyannis. Massachusetts. The report came from C. Ryan Barber, writing for the Cape Cod Times. This was how the Massachusetts senator defended an invasion that killed 506 children and every member of 81 extended Palestinian Gaza families, in a brutal one-sided military assault. Senator Warren is the current darling of U.S. political progressives. In her interview in Hyannis, she made no mention of the atrocities committed by Israel. These are not the words of a respected academic. They are the words of a liberal Zionist reading from an AIPAC script. If Senator Warren has, in fact, embraced the liberal Zionist world view that Israel has the right to do what is needed to support its occupation of Palestine, she may rightly be classified as a PEP (Progressive except for Palestine). “Say it ain’t so, Senator”. When loyal fans discover that a favored one has taken up with the wrong companions, they respond with a common response of betrayal. In 1919, there occurred a baseball betrayal so deeply felt that it remains with us today in the common memory of baseball aficionados. That betrayal involved “Shoeless Joe” Jackson, most recently heard from as a player (portrayed by Ray Liotta) in the movie Field of Dreams. “Shoeless Joe” was one of a group of Chicago White Sox players who shattered the dreams of loyal fans when they were charged with criminal behavior. The facts of the story are these: “Shoeless Joe” Jackson was on trial as one of the players accused of throwing games at the behest of gamblers in the 1919 World Series. “Say it ain’t so, Joe”. Forty years later, in 1949, Furman Bisher interviewed an aging Jackson for SPORT magazine two years before Jackson died. In the interview, Jackson said he did not remember the incident of the pleading fan. News stories at the time insisted the boy’s lament did take place. Bisher’s interview revealed Jackson’s bewilderment that after a jury acquitted all of the players of any illegal behavior, Kenesaw Mountain Landis, the newly appointed Commissioner of Baseball, banned all eight players from ever playing again. The legend of “Shoeless Joe” Jackson lingers on in baseball lore to remind us that betrayal hurts the most when a favorite who had been trusted proves to be unworthy of that trust. Warren’s progressive political base was stunned when she embraced Israel’s rationale for its invasion. To a major segment of Warren’s political base, an endorsement of Israel’s continued immoral and brutal conduct in the invasions and the ongoing occupation is felt as betrayal of the highest order. In sports, as in politics, two public arenas so much alike in so many ways, urchins of all ages are emotionally wounded when their heroes or would-be heroes are exposed by reality. It is still too early for progressives to brand Warren as a PEP. She has, after all, developed skills that has made her a successful politician since her days as a Washington economics guru. The next few months will test her ability to balance conflicting political demands. 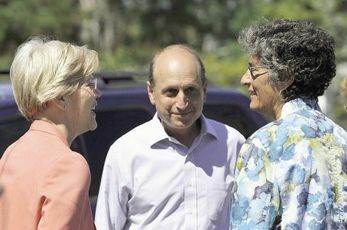 When Elizabeth Warren came to Tufts University in Medford on Monday she was met by anti-war and Palestinian rights activists who asked why the popular senator and national Democratic Party celebrity seemed to echo Israeli talking points about the recent Israel attack on Gaza. The Boston Globe reports that Warren, one of only four sitting senators yet to take a congressional overseas trip, will most likely join a delegation traveling to Israel after the November midterm election. How she handles such a trip will be an indication of her ability to play in the Major League of presidential politics. The Israeli-controlled congressional trip will, no doubt, go no further into Gaza than a ceremonial visit to the mouth of a tunnel that reached into southern Israel. Senator Warren should demand a personal visit into Gaza, with unfettered conversations allowed with victims of the invasion. She should also demand a visit to the area of the West Bank where Israel claims its “right” to steal more Palestinian land for an expanded settlement between Hebron and Bethlehem. Anything less on Senator Warren’s itinerary on her first senatorial trip to Israel/Palestine would be an ominous revelation that she has betrayed her progressive fan base. The picture of Sen. Elizabeth Warren (D-MA) at the top is from Mondoweiss. The picture at top is of Sen. Elizabeth Warren, left, and state Sen. Dan Wolf talking with Andi Genser, executive director of We Can, during a visit to the We Can facility on Thursday, August 20. It is from the Cape Cod Times. The picture was taken by Steve Heaslip. The picture of Sen. Warren is from Mondoweiss. This entry was posted in Hillary Clinton, Media, Middle East, Middle East Politics, Politics and Elections. Bookmark the permalink. Maybe the Palestine issue could be an ethics test to reveal the extent to which persons really are decent human beings. Question: Who in the name of “secular democracy” is a “liberal Zionist” as Sen. Warren is alleged to be? As in your quote: If Senator Warren has, in fact, embraced the liberal Zionist world view that Israel has the right to do what is needed to support its occupation of Palestine, she may rightly be classified as a PEP (Progressive except for Palestine). Is a “liberal Zionist” one who views Israel as having a right to occupy all of Palestine? And give “rights” to the natives? When she echoes Zionist orthodoxy as practiced from the beginning, how can she be, in any sense, a “liberal Zionist”? Like almost every single politician in the US, especially ones that have national ambitions, saying anything against Israel’s policies would ruin any chances of winning a high position. The money and influence of the Israel lobby, through AIPAC, with it’s tentacles of millions of dollars working in many pro zionist lobbies, has no match in this nation of ours. They are a single issue lobby—“What’s good for Israel” That’s it, and they will make sure a pro Palestinian, pro justice candidate never wins. They well destroy that candidate, and the media will help them. If Warren has political ambitions, she has to keep her mouth moving to please the Israel lobby. Unless people are willing to oppose the Lobby and make that their single issue, and get millionaires and billionaires to back that lobby, it’s hard to see how anything will change regarding US policy. Does anyone see this happening or see an alternative to stop the US from supporting Israel’s horrendous policies? Excellent analysis, Mr. Wall. Thank you. Sadly, Warren’s stance should not have been news to progressives…she and many other Democrats have been parroting the right-wing Israeli line for a long time. Check out Bernie Sanders’ views on Israel, for example. The Senate has just once again passed a unanimous resolution favoring Israel, this time for closer military cooperation. Thanks for this report, Jim. I was scandalized to hear of Elizabeth Warren’s comments. I wrote a letter to In These Times, famous Chicago based “liberal” magazine endorsed by Kurt Vonnegut among others, when they featured Sen Warren with a big glowy picture on the cover this week and presented her in two! articles as a liberal’s liberal whom all of the left community should heartily endorse, with no mention of her words about Israel and Gaza! Other than a cartoon by Tom Tomorrow two issues ago I didn’t see any other mention of Israel’s massacre in Gaza in the mag. I think Kurt Vonnegut would be on their case big time, as well as on Elizabeth Warren’s! If Senator Warren is the current darling of U.S. political progressives. I shudder to think of what it would be like for the US with political conservatives.